Continuing on the trend of actual competent and enjoyable summer blockbusters, Dawn of the Planet of the Apes has finally made its way onto screens and I’m happy to say that the film very much lives up to the quality of the previous film and in many ways surpasses it in what it tried to do with a Planet of the Apes franchise. The stand out point in the film is definitely its characters and in particular the ape characters. Andy Serkis as Caesar and Toby Kebbell as Koba certainly steal the show in this one, both actors are flawless in their attempts to bring these computer generated apes to life and for me personally it never felt like I was watching two people who were obviously in performance capture suits pretending to be apes instead I bought into the believability of these two characters. Both of them had motivations that you could follow and understand the personalities came through clear as day, you knew what it was that defined these two characters and that just helps in the whole purpose within the film. I feel if that hadn’t been the case in this film then it would have fallen flat on its face and I’m glad it didn’t. 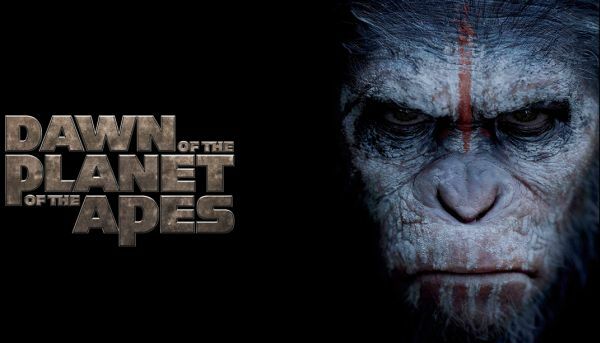 The human characters are not as strong or flushed out in this film but to be honest I had no problem with that, when I go to see a planet of the apes film I’m looking to see an interesting take on a developing society of apes and not just cliché humans wanting to wipe out the big nasty apes. Thankfully in this film it seemed the people behind the scenes knew just how much to give the human characters and to not over step that which I’m very happy about that the much more interesting ape characters where given more than ample time to be explored and understood just helped to keep the flow and feel of the film moving. Another point in this film that had the filmmakers got wrong would have well and truly panned this film is its visual effects and set design, thankfully they didn’t and because of that the film is more than impressive in how it comes across on screen. The look of the film is brilliant, from the sprawling woodlands where our large family of apes live to the desolate over grown cities where our human characters are surviving, the film has no problem in engrossing you in this very rich and interesting world, it’s also helped by the fact that when they could use real practical sets instead of large sound stages filled with green screens they did and you certainly get that sense that this is an actual place they’re in, this location actually feels tangible. It’s the little things. The plot in Dawn of the Planet of the Apes is an easy one to follow along with. Humans fear apes, apes hate humans (the adjectives are interchangeable for both) and now they have to help one another out and find out if trust is something that the two parties can find in one another. Simple yes but it makes for some very interesting conflict between to very opposed sides and is elevated by acting that doesn’t falter on any ones part. The films plot does inevitably lead to a large battle sequence in the end but how the story gets you to that point is so well handled and then the battle sequence its self is so well shot and laid out that I even found myself enjoying it and not turning off my brain while the usual big silly action sequences happen, once again with this film it could have tripped up and ruined a perfectly good film but it didn’t, it knew what it was and it did it in a way that is fun, idea inducing and not once boring. After going over this film in my head a few times I came to the interesting conclusion that I didn’t really have any complaints about this film. I enjoyed it from beginning to end, the Caesar character in particular was a highlight for me and one I very much look forward to seeing in other films in the franchise and over all I had fun with the film. It has been a nice change of pace this summer blockbuster season to go to the cinema and actually watch consistently good films, especially when you look at the train wreck that was 2013. I also think that out of all of the big summer films that I’ve seen this year Dawn of the Planet of the Apes might be one of my favourites. This is a film that just gets every beat of the drum right and never did I feel that it had lulled or gotten overly silly it just kept a level head on it and in the end was a fantastic film to watch and I would certainly recommend it to anyone.